In Habitats, each player builds a big wildlife park without cages or fences. The animals in your park need their natural habitats: grassland, bush, rocks or lakes. The zebra needs a big area of grass and some water adjacent, for example, while a bat needs rocks and bush and water, a hart needs bush and grass, and a crocodile needs mainly water. There is a snake, baboon, bee, elephant, otter, lizard, turtle, eagle, meerkat, scorpio, hog, catfish, rhino, etc., each with its own landscape requirements — 68 different animals in total. When adding an animal tile in your park, you add its main landscape — the base space for the animal — to your park, too. While placing this new animal, its own piece of landscape can help to fulfill the requirements of your other animals’ requirements, e.g., the water on a hippo tile fulfilling the adjacent otter’s need for water. Thus, fulfilling every animal’s desire for land becomes a more and more difficult task with each tile you add. 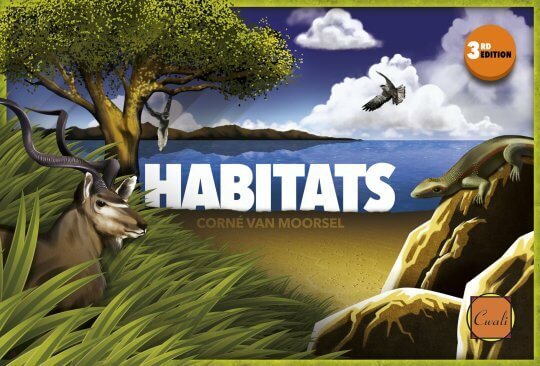 Habitats lasts three seasons, with each season giving each player 6-9 new tiles for their parks. Whoever has best met the goal of the season receives bonus points, with a smaller number of points for second and third place. At the end of the game, each player scores for each tile in their park based on whether that tile’s requirements are satisfied. Whoever scores the most points wins!